An esthetician gives a wide range of beauty services to help their clients look and feel better. While aesthetics is a new profession that has experienced huge growth in the last decade. Estheticians work in the field of cosmetology to assess and treat beauty needs and problems. They are sometimes confused with cosmetologists who mostly do hair and makeup and do not require any formal training. Estheticians address the needs of individuals dealing with medical conditions and surgeries that are adversely affecting their skin and not just help with standard cosmetic concerns. The duties of esthetician differ between a basic esthetician and a medical esthetician. 1. Coming of age - you must be 16 years old and have a high school diploma or GED equivalent in order to enroll in an esthetician program. 2. Check your State’s requirements - except Connecticut, all states require estheticians to be licensed and have completed a state-approved cosmetology or esthetician program. Thus, you will first need to find out the requirements of the state in which you intend to hold your license. 3. Find an accredited school - be sure it is part of a state approved and accredited cosmetology or esthetician program when seeking a school for esthetician training and one of the best accrediting agencies is the National Accrediting Commission of Cosmetology Arts and Sciences or NACCAS. 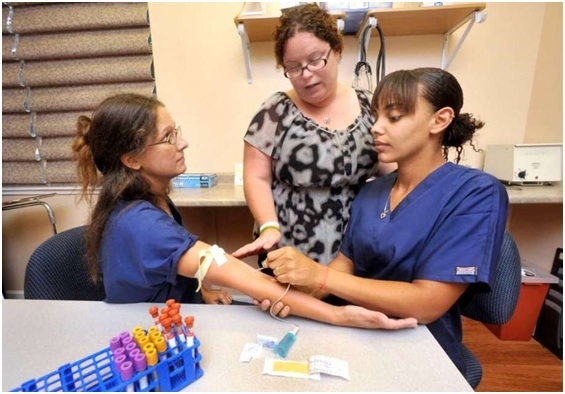 Some technical high schools offer this type of training but many pursue their schooling through a postsecondary vocational training for esthetician school. 4. Choose your specialty - make sure you take the correct courses needed to pursue the particular type of employment you are looking for when you enroll in a program. 5. Take the exam - take the state board exam which will include both written and practical portions. You have to demonstrate your skills in person to a test proctor. 6. Search for employment - highlight your technical experience and any specialized training you have received upon approaching prospective employers with a fine-tuned resume. 7. Continue learning - it is important to follow all state guidelines to avoid the loss of a license because some states require estheticians to take continuing education courses to remain fully informed regarding the most recent methods and furthermore invigorate their memory about the ones they already know. The job outlook for estheticians is great having 25 percent of growth expected by 2020. There are a lot of different options to choose from due to the varied specialties available under the full umbrella of esthetics. You can be a medical esthetician if you prefer to work in a medical environment and become a basic esthetician if you prefer to work in a relaxing spa atmosphere.